Observed at the margins of a water hole, Abedares National Park, Kenya. June 2017. 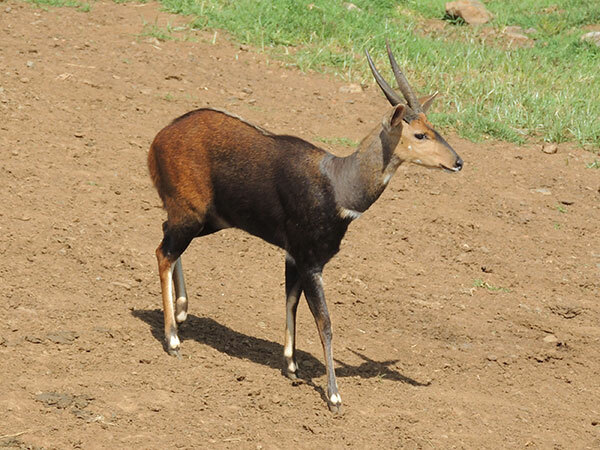 These mid-size antelope browse on shrubs and low trees and tend to remain in the cover provided by shrubby growth during the day, emerging by night for more active browsing. Bushbuck are widely distributed across Sub-Saharan Africa and populations across the range have been given varietal and subspecific names. Some authorities argue that several sibling species are included in this classification. Copyright Michael J. Plagens, page created 26 Sept. 2018.